Piaf, (named for KVD's hairless cat) from the Kat Von D line of makeup. I saw that this shade was coming out in the fall launches and I thought it seemed like a fantastic autumnal lip shade. 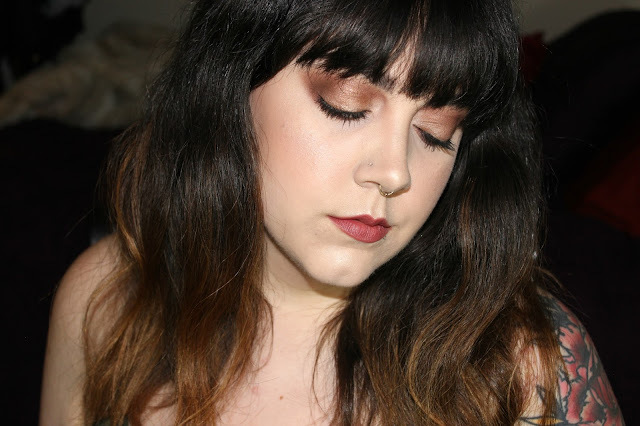 I have always been a Kat Von D lip product fan, so I expected to like the formula and all that jazz. I was very much, as usual, pleased. This is one of those shades that is very "Kat Von D", meaning that it's a real artist shade. The formula is long wearing, matte, and pigmented. It applies evenly and smoothly. 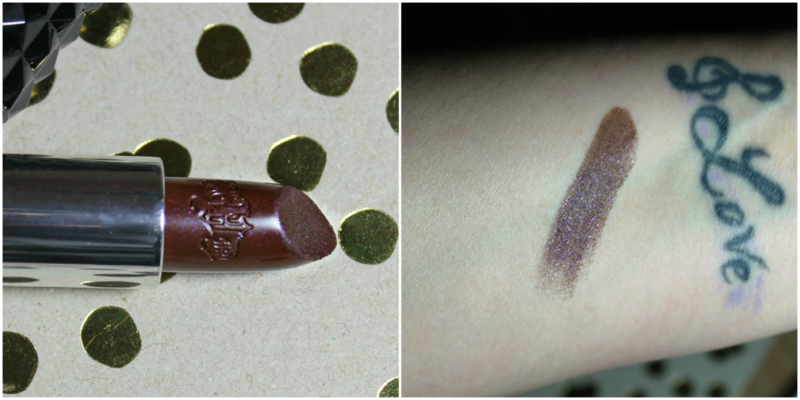 Described as a cool chocolate with purple shimmer, this lipstick is one of a kind. I don't know about you, but I haven't really seen this type of shade before. That is part of why I love this makeup range so much, because it really bends the lines of standard beauty. Standardized beauty is always an interesting thing to me, because the standard is set by a culture, sub-culture, market and industry in a sort of case by case basis. Meaning that what a general culture finds beautiful may be less attractive to a sub-culture within that same community. So, the idea of "beauty standards" is far from standard, unless you are talking to a specific person, within a specific culture, and then within that, whatever area of that culture they fall into, whether that be main-stream or the many other options out there. These reasons are why I support brands that bend the idea of what is pretty. Don't get me wrong, though. I love me classic looks. But I like some funky stuff too. If you or I like a color that reasoning should be enough. With a thing as fun, silly, playful, and gloriously creative as makeup, why should a narrow scope be put on it. Beauty is very subjective and I like when brands offer a more wide range of options that reach many people. Art should not be bound by standards of beauty. diverse as beauty, standard. I like to talk about these things from time to time, because as much as I love makeup and the beauty world I want people to understand that beauty is wide and deep and has many faces, shades and options.